WHAT A NIGHT! | OFF KLTR! 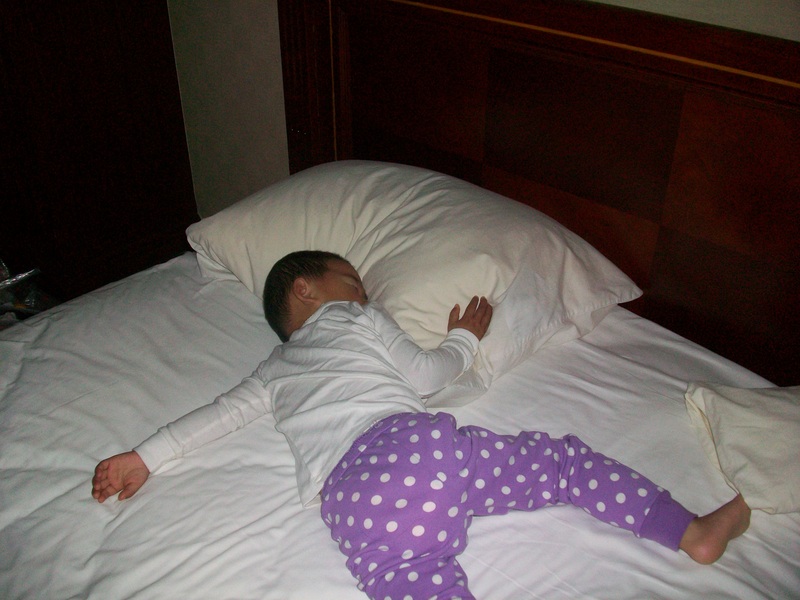 Lauren sleeping in Henan, China. So last night while I was trying to post my whole cranio-electrical saga, all hell was breaking loose with my dear daughters. Lauren went to bed at 6PM as originally scheduled, but she was half-awake/crying from 8 to 10PM. During that time, Keira was very upset because she couldn’t fall asleep. She said that she had a headache. More specifically she said that her third eye hurt (that was pretty cute, actually)! So I was up in the girls’ room, trying to coax Keira to asleep. And, Lauren heard me with Keira and FREAKED OUT! Screaming, crying hysterically. She was jealous of Keira’s night-time attention, I think! Keira is usually pretty easy once she’s in her bed. She loves her bed. It often takes her a very long time to fall asleep, but she is very happy to just get cozy in her bed and “do her dream”, which I can only imagine means daydream! But Keira needed some extra hugs and kisses and attention last night. So luckily for me (and my two daughters), their father is pretty awesome and he took little green-with-envy-Lauren into another room so that Keira could fall asleep. Which gratefully, she did! So anyway…after Keira fell asleep, I sat with Lauren ’til she sort of fell asleep, but she is doing this thing where she sleeps with one eye open! It’s our fault, really. We don’t make her fall asleep on her own. We rock her or lay down with her ’til she falls asleep. But sometimes, like last night, she just will not let herself fall into a deep sleep. I think she just doesn’t want us to leave, so she uses all her might to stay awake! One thing that Rob and I have really noticed is that when Lauren takes a nap in the afternoon, she doesn’t go to bed ’til 9ish, but she tends to sleep through the night. Typically when she does not take a nap, she wakes up twice, sometimes three times a night. So maybe we should let her nap and have a little friend up with the grown ups ’til we go to bed? It’s not ideal, but neither is her waking multiple times during the night. The other down-side to this alternative plan (naps & late-night) is that Keira will need to be in bed BEFORE Lauren and she ain’t gonna like that! I would say that for me, the hardest part of parenting toddlers has been sleep. And sleep affects their waking hours sooo much. It’s a big one. I have read lots and lots of books on the subject, but in the end, I usually just end up hating each know-it-author because I cannot implement their strong recommendations and end up feeling even more frustrated. But one book that is at the very least encouraging – and actually does offer lots of good suggestions on different ways to accomplish different sleep goals, like getting your child out of a family bed and into her own bed – is Elizabeth Pantley’s Toddler Sleep Book. In fact, I think that I’ll take my own recommendation and re-read a few chapters tonight! Might give me a few good ideas and it will DEFINITELY put me right to sleep!! Any other sleep or sleep books suggestions?!?! I hear you in this one! As you know, we are going through a little change in the sleep routine, too, and it’s tough on everyone. I do remember going though a phase with Graham a couple years ago when he wasn’t napping and that lack of sleep during the day really disrupted his nighttime sleep. How about setting up a sleep consultation at Isis? I’ve heard very good things about them. Good luck tonight! Hi Lori! How is your little escape artist these nights?! What a great tidea about the Isis sleep consultation. I’m going to look into it. I wonder how much it costs? Well…I suspect that the longer Rob is up all night, the less cost becomes a concern!! Ellie did not nap Monday at daycare, nor yesterday at home, and today she took a 30 minute nap at daycare, so maybe there is hope for us yet? Graham napped until he was 4. I’m not ready for her to give it up yet, so Ellie better get with the program! I think we might be in favor of consistent naps. We did this with Keira. The problem is that Lauren does not cooperate. She resists the naps. Therefore, the only way to get consistent sleep is to control the bed time. Why don’t kids just do as they are told? I’ll let ‘ya know what I found out about the sleep consult (wink-wink)!! I don’t think it’s a ridiculous amount. Maybe $100 or so? Not that that is where you want to spend your money, but hey, what is your sleep worth to ya? The less sleep you get, the more it’s worth! I want to read that new sleep book, you know the one “Go the f@ck to sleep!”. Humor helps exhaustion! Oh, I AM ordering that book!! I can always count on you for a great book recommendation, Elizabeth! !